Some security cameras notify you when they detect motion or sound. Some security cameras notify you when they detect motion or sound. The compact, wireless Honeywell Lyric C2 camera goes an extra step. It can intelligently detect the difference between a smoke alarm and a baby crying and send a specific alert to your smart device. The free Lyric app is the true wizard behind this camera. It lets you watch a live feed on a secure, encrypted connection and zoom in up to 6X closer on important scenes. You can configure the camera to send you push notifications when it detects sound or motion, so you'll know when someone's in the house. The camera features a 145-degree wide-angle lens, so wherever you put it, you'll get a great view. Its integrated combination stand/bracket can be manually tilted up and down, so you can put it on a table or shelf and aim the camera right where you need coverage. It can even see up to 32 feet away in the dark. 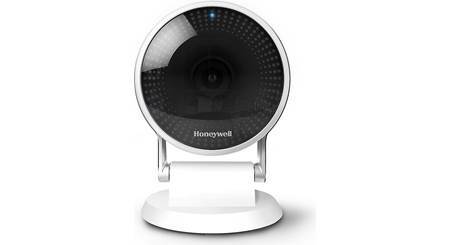 Overview: The Honeywell Lyric C2 Wi-Fi Security Camera lets you keep an eye on your property from virtually anywhere. Using the Lyric app, you can receive alerts whenever motion or sounds are detected, or let you live stream from the camera whenever you like. The camera comes with a tilting stand, a 6' power cable, and an 8 GB microSD memory card. Video/Photos: The 1080p Full HD camera can record videos (MPEG-4 H.264 compression) or take 1 MP JPEG photos. When motion or sound is detected, the camera records a 30 second clip (5 seconds before the sound or motion and 25 seconds after), then uploads it to the free secure cloud storage and sends you a notification. If the cloud is unavailable or the camera is not connected to the internet, the clips are stored on the SD card, and uploaded to the cloud when the connection is restored. Live streams are not saved. Lens: The C2 Wi-Fi Security Camera has a wide-angle lens with a 145° view so there's no need to tilt or pan. The 6x digital zoom allows you to get a closeup of the desired portion of the scene. 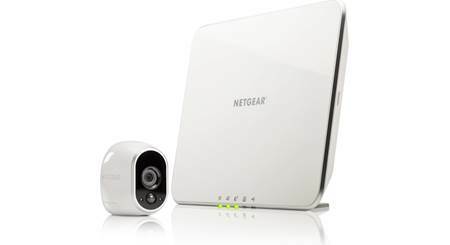 Wi-Fi: The camera features Wi-Fi connectivity, and is compatible with IEEE 802.11 b/g/n, Dual Band 2.4/5 GHz. It operates on a minimum bandwidth of 2.048 Mbps for 1080p, or 1.024 Mbps for 720p. Lyric App: The C2 Wi-Fi Security Camera can be controlled by your smartphone, tablet, or laptop through your home Wi-Fi network. Through the Honeywell Lyric app, you can view and change settings from anywhere, and receive alerts if motion or sounds are detected. The Honeywell Lyric app is compatible with smartphones and tablets running iOS 9.0 or later, or Android 4.3 and up. Motion/Sound Detection: When the camera detects a sound or motion, it will send an alert to the app. You can set the sensitivity of the Motion Detection from low (detects only big movement) to high (detects all movement and changes in environment), or turn off motion detection. Likewise, you can set the Sound Detection from Low (loud sounds only: 80-100 decibels) to High (all sounds (10-100 decibels), or off. The camera's Intelligent Sound Detection can determine when the sound detected is coming from your smoke or carbon monoxide detector, and will send you an alert that the smoke or CO alarm is detected. The camera can also detect a baby's cry and alert you on the app. Note: The camera has been tested to detect smoke and CO detectors from Honeywell, First Alert, Kidde, and Nest. If your detector brand is not listed, you can still test the camera for compatibility. Detection Zones: Using the Lyric App, you can set up to four Detection Zones for extra sensitivity or to ignore background motion, such as a ceiling fan. Each zone has its own sensitivity setting (low to high). The zones cannot overlap. Geofencing: You can use geofencing to determine when to turn the camera on or off. Using the location of your mobile device, the Lyric app can sense whether you are away or at home, and can turn the camera on or off as desired. The geofence radius can be configured on a map in the app. Night Vision: The camera has Night Vision up to 32.8 feet (10 meters). The app's Night Vision settings can be set to Always On, Always Off, or Auto (camera adjusts the settings automatically). Two-way Audio: The Lyric C2 Wi-Fi Security camera provides two-way audio capability between your smartphone or tablet and the camera. 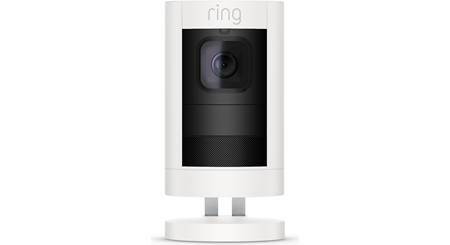 This lets you speak to anyone in your home from your smartphone, whether it's greeting the kids when they arrive home from school, or telling an intruder in your home to get out. microSD: The camera has a slot for a microSD memory card. The card can be used to store photos and videos recorded by the camera, in case the camera's connection to the cloud is lost. The slot will accept microSD cards up to 64 GB. Cards with an SD Speed Class rating of 10 are recommended. An 8 GB card is included. Mounting Options: The Wi-Fi Security Camera can be surface mounted, using the supplied adjustable stand. The camera can be tilted forward or backward nearly 180° for best view. You can also wall-mount or ceiling-mount the stand. The stand can be easily removed for wall mounting the camera alone using the built-in keyhole slot. Mounting screws and wall anchors are included. Can I use this Lyric C2 camera in the Netherlands? I'm afraid there aren't enough details provided by the manufacturer to determine compatibility for using overseas. You may want to try contacting Honeywell's Support directly for more information--you can reach them by phone in the U.S. (toll- free) at 1-877-841-2840; or Internationally at 001 (480) 353-3020. 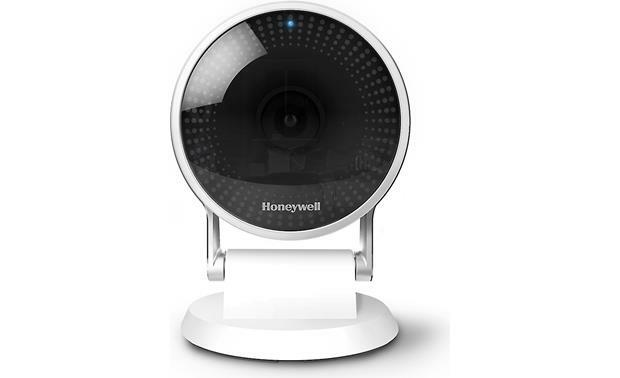 Searches related to the Honeywell Lyric C2 Camera Wireless full HD indoor security camera with Wi-Fi®.